So far, I’ve written about easy green makeover ideas, energy- and water-saving tips, and eco-friendly countertop options. In this post, we’ll explore the ever-growing choices for stylish and functional flooring in the kitchen and/or bathroom. Can you guess which type of flooring is shown here? Wood? Cork? Linoleum? Tile? Cork is easy to clean, is comfy underfoot and can last up to 80 years! It is also available in many styles. (Globus cork flooring pictured above). Real Linoleum, not vinyl, is made entirely from all natural ingredients and is ideal for those who suffer from asthma and allergies. From contemporary to traditional looks, this easy-to-care-for flooring comes in a wide array of colors and is available in sheets, tiles and click-in-place planks. Ceramic, porcelain or glass tile made with recycled content is a long-lasting, durable option. Hardwoods have increased in popularity in America’s kitchens in recent years due to the longevity and durability of the product. 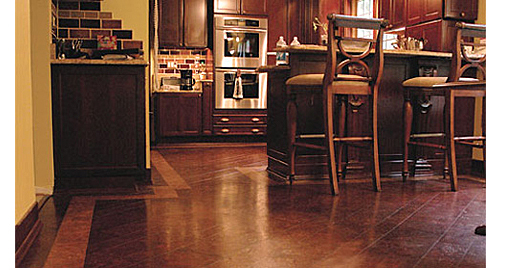 The most environmentally-friendly hardwood is an old one which has been refinished with non-toxic sealers. For new installations, reclaimed wood floors add instant charm. FSC-certified, or sustainably-harvested, North American hardwoods are also an excellent option. Bamboo, a fast-growing grass, is a great alternative to hardwood and comes in several styles, grains and colors. Look for those made with formaldehyde-free glues. I found this article to be very informative. The materials used sound durable and are sustainable as well. I am impressed by the beautiful kitchen floor in the photo.